However, the very diverse, fragmented and volatile VSB market is not for the faint of heart. And all too often, technology vendors operate on assumptions that are truer of the 1% of venture-backed startups than the average VSB. While all sorts of nuances must be considered, understanding the fundamentals is a must to have a good shot of being successful in the VSB market. Take the quiz and find out if you know the basics about what makes the 99% tick! VSBs are consumed with growing their businesses and staying afloat. Their challenges center on attracting new customers, growing revenues, improving cash flow and maintaining profitability. Other challenges, such as improving customer retention and satisfaction, and attracting and retaining quality employees are important but pale in comparison to money in, money out issues. 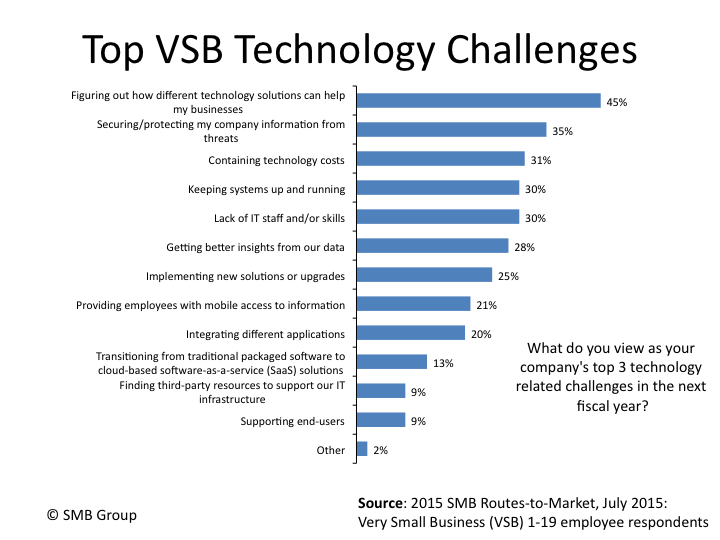 If you don’t speak directly to how your solutions can help solve these key challenges, it will be very difficult to get on VSB radar. Score 1 point if you checked b or c; zero for a or d.
VSBs are confused by all of the technology options out there! They often find it tough to figure out which technology solutions can really help their businesses. Other key tech challenges include: securing company information, containing technology costs and keeping systems up and running. Help VSBs cut through this confusion with clear information about how your solution can help them improve business outcomes–securely, affordably and reliably. Give yourself 2 points if you chose c; 1 point for b or d; and zero for a.
VSB budgets are very tight. 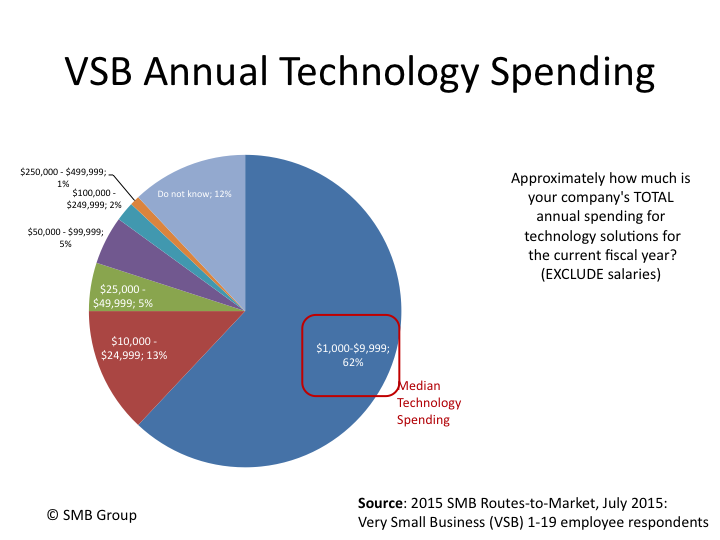 Median technology spending for businesses with 1-19 employees is between $1,000 and $9,999 annually. Be realistic about pricing for this market: remember that after paying for essentials (devices, connectivity, etc.) there’s not a lot left over. Score 2 points if you selected a; 1 for b and 0 for c or d.
In 41% of VSBs, no one is tasked with looking after IT! 34% are lucky enough to have an external contractor filling this role, with just 25% having someone on staff to do the job. Solutions must be easy to deploy and very intuitive to use to gain traction in the VSB market. Add 2 points for a; 1 for d, and 0 for b or c.
Time to tune up your search engine optimization engine! 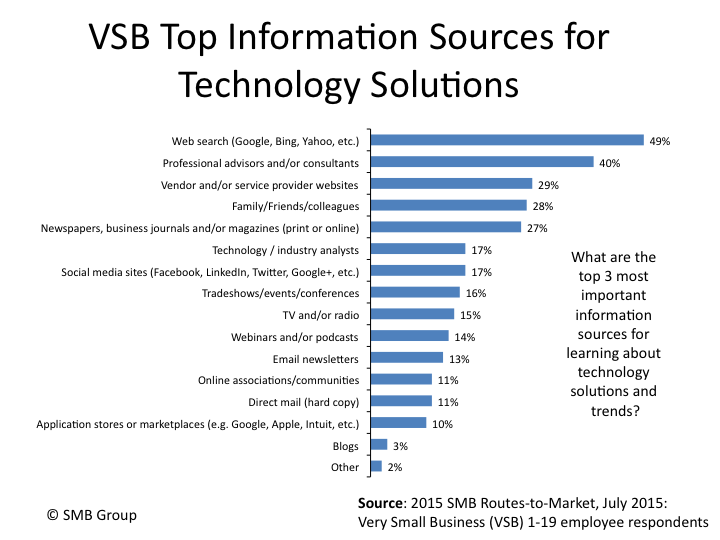 49% of VSBs put web search as one of their top 3 information sources. 40% say professional advisors/consultants are one of their top 3 sources. After that, VSB indicate their preferences for technology information varies greatly. Creating a strong presence with the top two information sources is critical, but broad coverage in the others is also key to reach this diverse audience. Give yourself 2 points if you chose d; 1 point for c; and zero for a or b. Better pricing trumps all, but ease of use is almost as important. 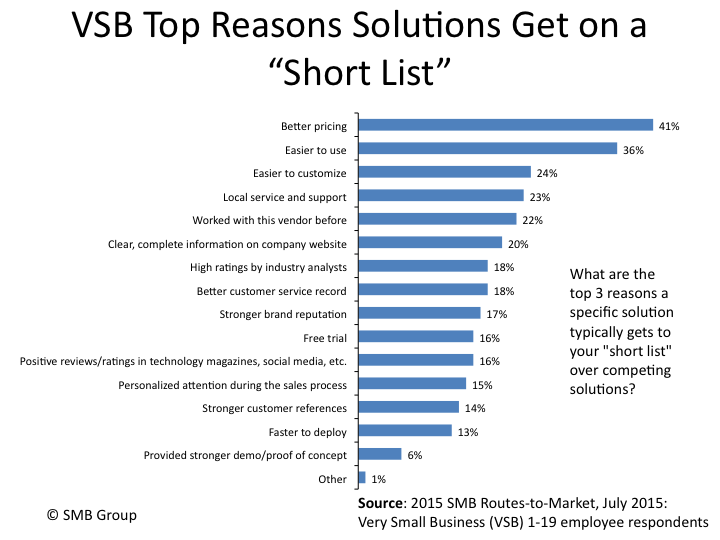 41% of VSBs rate better pricing as one of the top three reasons they put a solution on their short list. If a VSB decision-maker gets even a whiff of sticker shock, they’re likely to eliminate a solution from consideration. Ease of use comes in at number 2, with 36% of VSBs rating this as one of their top three considerations. From there, other criteria ranking drop into the 20% or below range. Score 2 for c; 1 for a; 0 for b or d.
9-11 points: VSB Expert. Congratulations, you are part of the elite group of technology vendors that truly understand VSB realties. You know how to engage VSBs on their terms, and your pricing isn’t likely to give them sticker shock. If we Google “small business” and your solution area, your company probably comes up in the top 3. With continued research, social media engagement, great content to educate customers, a strong stable of partners and influencers, and constant striving to make your solution easy to use, you have the right stuff to compete successfully in this very tough market. 5-8 points: VSB Intermediate: Your knowledge of and comfort level with VSBs is growing. You’re likely to already have a plan, but you need to up your game to rise above the noise and carve out a sustainable, scalable volume play in the VSB market. Team up with influencers and partners who are already strong in the space; join relevant groups on social media; tune your understanding of VSBs with research and 1-1 time onsite with VSBs; sharpen content so that it really resonates with VSBs. 4 points or less: VSB Novice: Congratulations for having the courage to start thinking about whether or not the tricky VSB market is a good fit for your product and/or service. Build your understanding of VSB customers with research, 1-1 conversations at events, joining relevant social media conversations, groups and to get a better feel for VSB behavior, concerns and goals. Study best practices of companies that have been successful in this market, as well as those who have failed. By listening and learning before you launch into the VSB market, you can avoid many of the traps that a novice might ordinarily fall into.